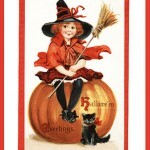 You will find some beautiful and funny Halloween postcards here. 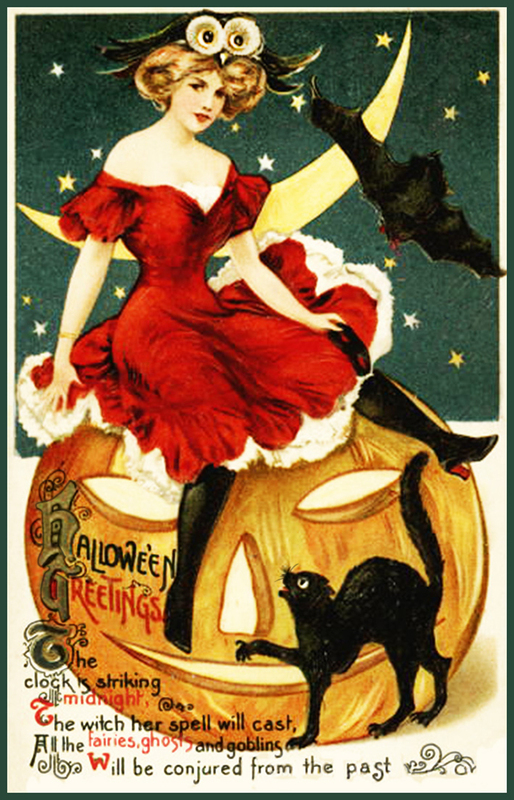 They are made in the Art Nouveau style, or you could call them vintage Halloween cards. I have restored very carefully, and now I find they will be so charming to use for a Halloween greeting. 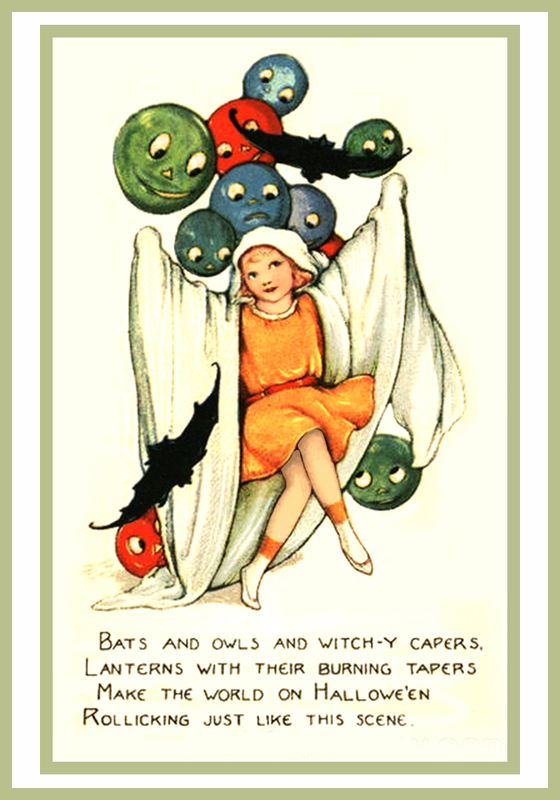 A lot of these greeting cards already has a poem on the front, but I have collected some cute Halloween poems to go with the cards on the back, or to use with other cards. You can use these restored cards for free, as long as it is for your own personal use. I think you shall print them with 200 dpi, a good printing quality. Then the size of the card will be 3,5 x 5 inches (approx. 8,9 x 12,5 cm), but you can change the size of the card before you print it, if you like. 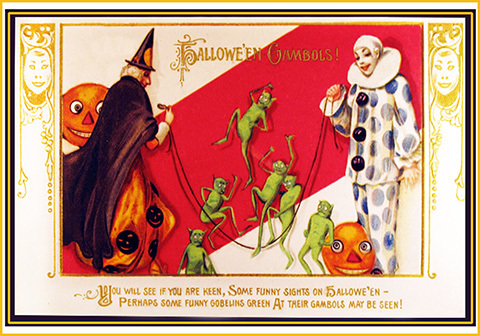 The Halloween cards you see here on this page are made smaller and a quality that is OK for the internet, but for printing you should click the card and save the larger version that pops up in a new tab. You can print these cards and send them to friends and family, but you can also use them to make e-cards. If you want to make your own Halloween cards, then I can recommend this page with free Halloween clipart. 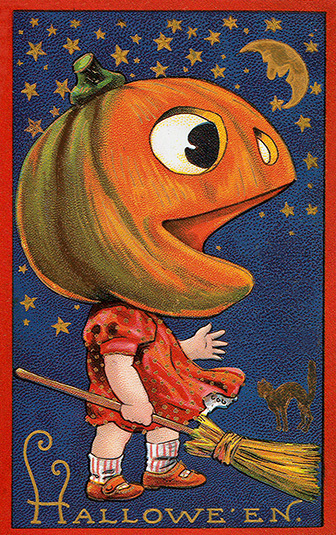 Also you can find new original cards for halloween here. 3. 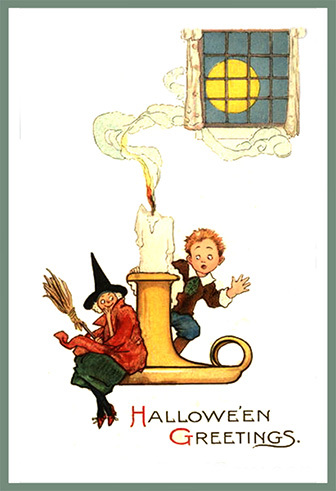 A greeting card for Halloween with a boy and a girl, and a big Halloween pumpkin, carved for making a Jack O’Lantern. 5. This card is so cute, with a small Halloween witch sitting on a pumpkin, and with a small black Halloween cat. 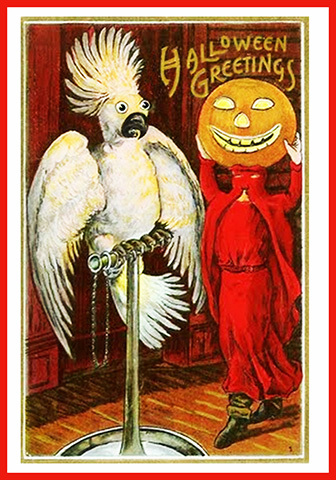 The text says: Halloween Greetings. See your right lights chine. 6. Also a greeting card for Halloween, with a tiny witch and a very small boy, and the candle with mysterious smoke floating to the window where you see the full moon. A funny and cute Halloween greeting card. 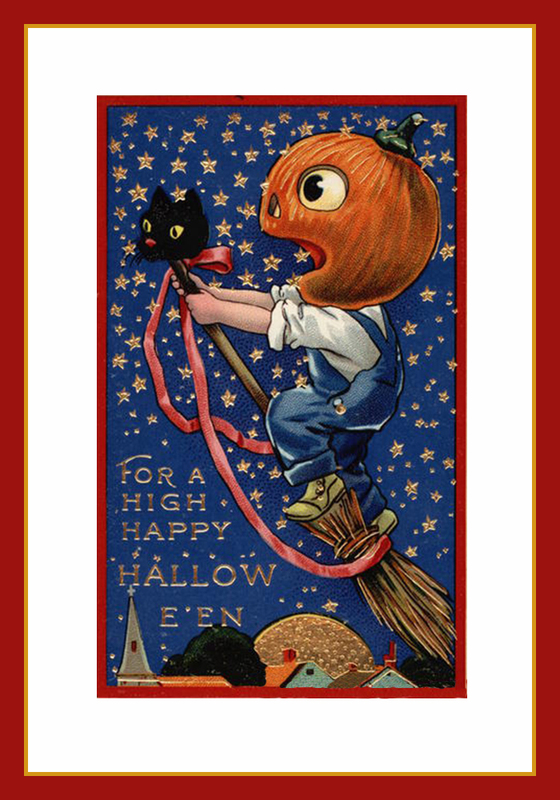 And the motive is Halloweenish strange, with a boy with a pumpkin head riding a witch broom with the head of a black cat. 8. 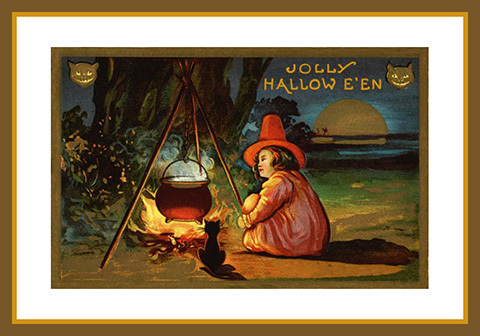 A Jolly Halloween postcard. “May Fate bee good to you.”. I had to leave that out when I restored the card, but I think it is a great wish to add to a Halloween card. 9. This cute Halloween greeting also comes as an invitation later, but for now you have this funny card with a little girl with a happy pumpkin head, a moon, stars, cat and broom. Like the next card, this one is a little larger than the rest, 3,5 x 5,5 inches approx. 10. 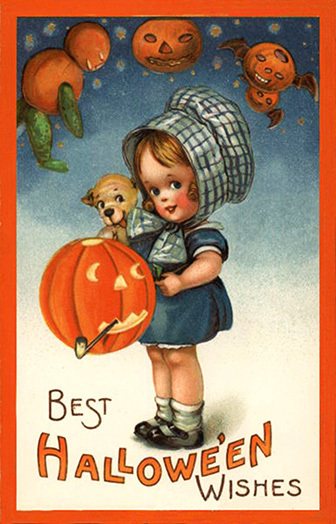 One more of these funny old Halloween greeting cards is with a little girl and her puppy. 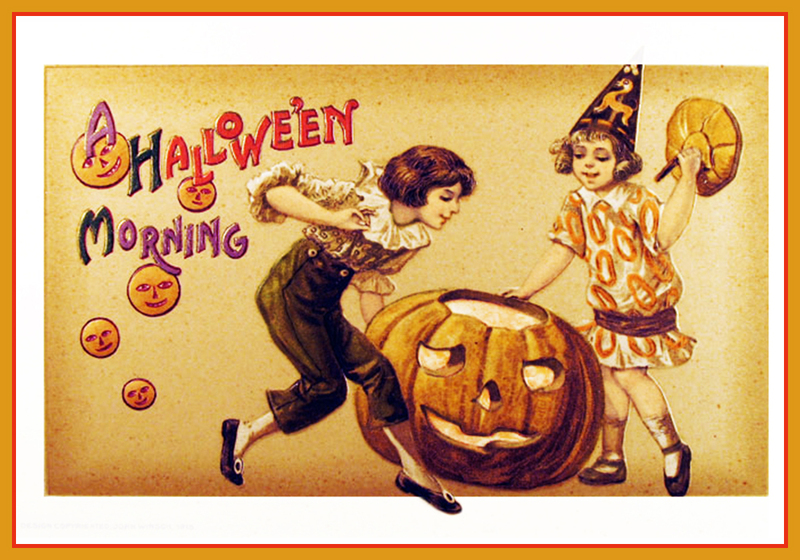 The girl is carrying a carved Halloween pumpkin, the pumpkin head is smoking on a pipe. A strange Pumpkin Man and pumpkin heads are floating in the background. Notice: This card will be 3,5 x 5,5 inches approx. when printed with 200 dpi. 11. 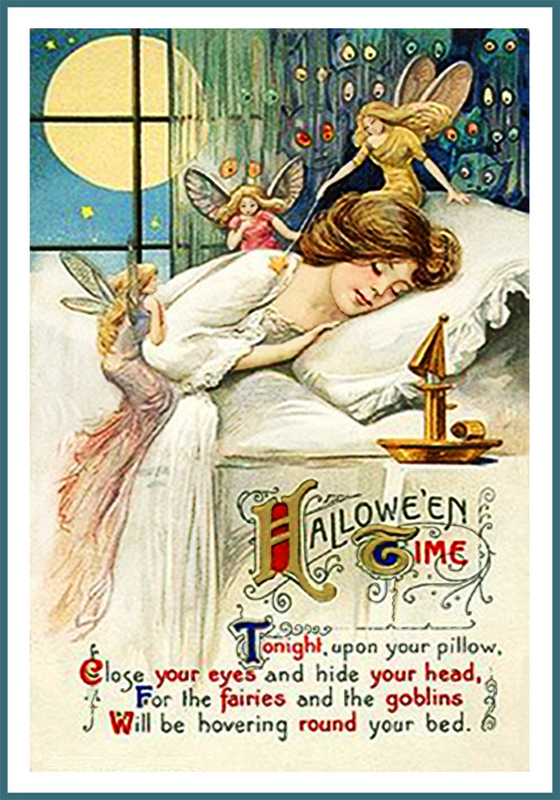 An adorable vintage Halloween postcard with a sleeping girl, surrounded by fairies and goblins. Close your eyes and hide your head. 12. 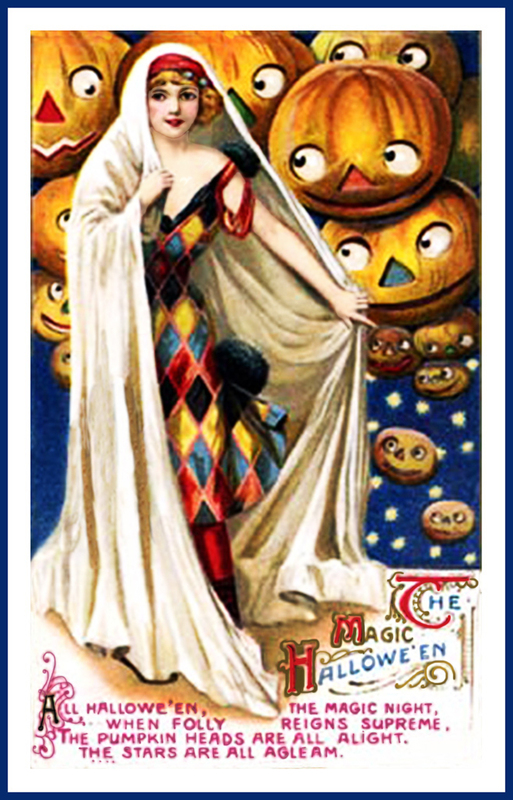 A young woman dressed in harlequin pattern dress, surrounded by lots and lots of pumpkin heads. 13. 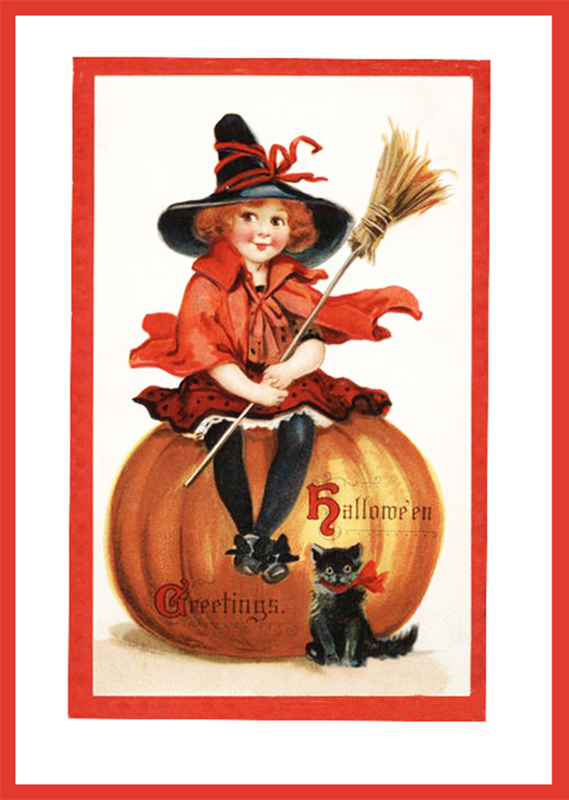 I find this Halloween greeting card very beautiful, with the big eyed owl placed on the young woman’s head as an elegant hat. The motive has a black Halloween cat, a bat, the moon, a pumpkin head, a young beautiful witch dressed in red and finally the owl. The witch her spell will cast. 14. 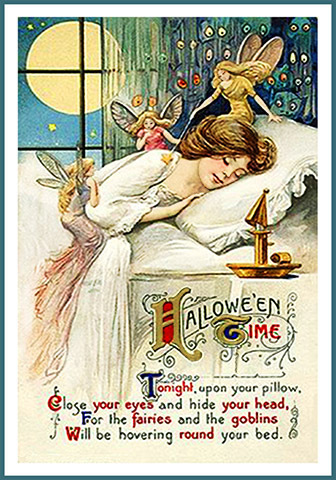 A wonderful vintage, art nouveau Halloween postcard. I haven’t added any text to the card. You can do that in a drawing program or with a tush if you like, but I actually like the Halloween picture with all the ingredients for Halloween so much that I decided to leave it as it was. 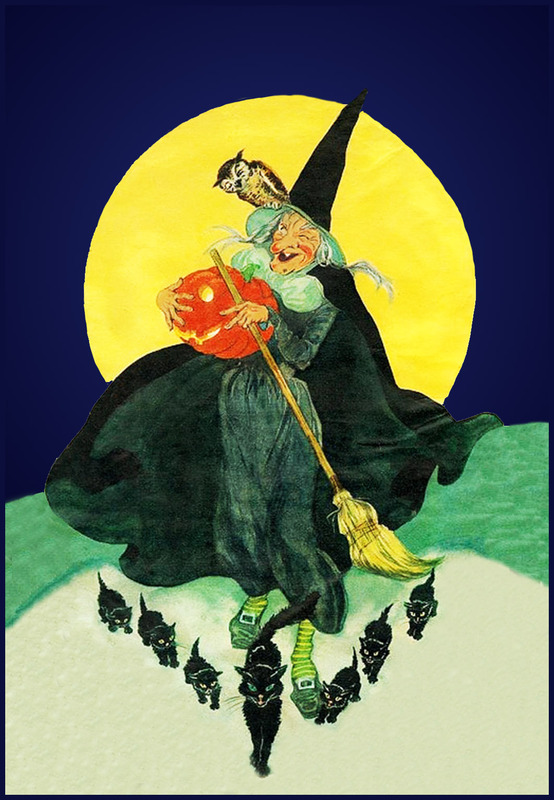 You have the old, funny witch, her owl, a pumpkin head, a broom and 7 black cats following the witch. And behind all this the full moon. This card is so full of Halloween humor!